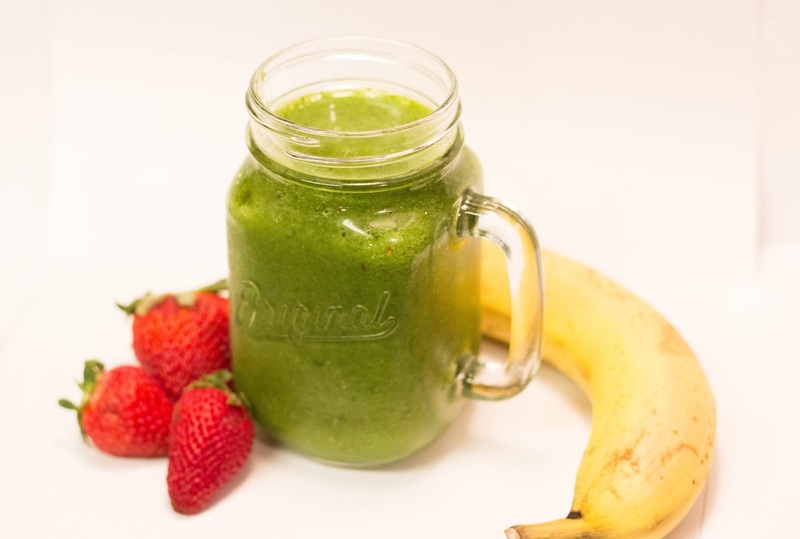 Tasty Tuesday: My Favorite Green Smoothie | For the Joy of Life. I like green veggies, in fact, my favorite veggie ever is hands down broccoli. I love salads, zucchini is a staple in our house, and I crave balsamic baked asparagus! However, I'm definitely guilty of not eating my greens every single day. Or.. smothering them with cheese or salt to make them taste even better! I also struggle to get my 13 month old to eat her veggies. 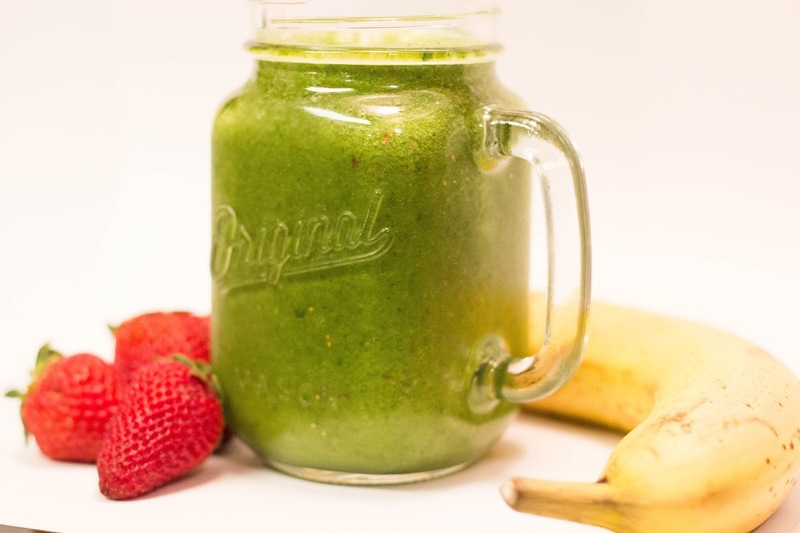 So, I decided to try out making a green smoothie every day! 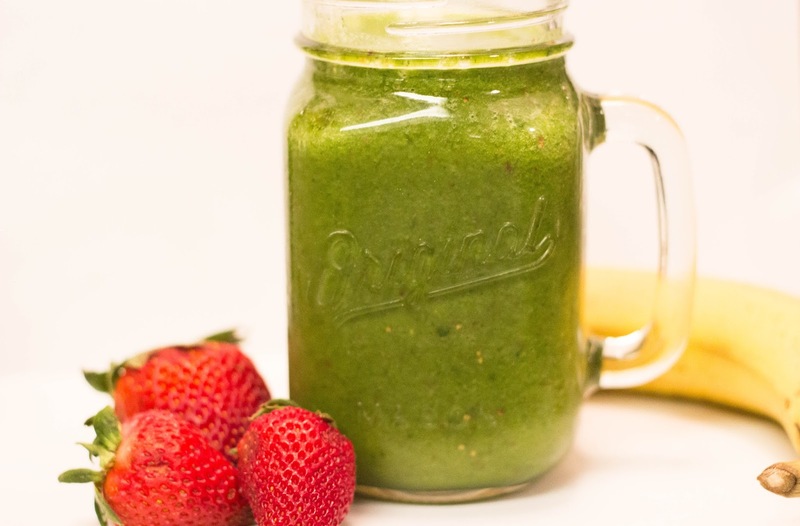 It came out so great on the first try and I've now been making this exact smoothie for the past few weeks every single morning. I literally crave it if I don't have it and it is totally making me feel better throughout the day. 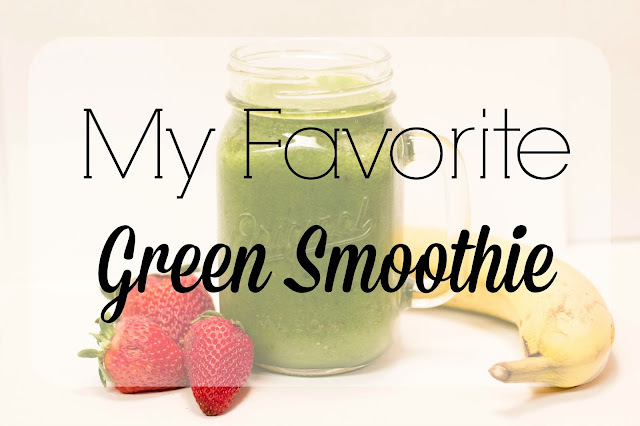 It is such a quick and easy way to load up on my greens and fruits. I usually give Oaklyn some in a sippy cup as well, but she doesn't always drink it... we're trying! This recipe should make two full glasses (I use mason jars) and just one glass is really filling! 1) I always put my ice in the blender first. I like when it gets crushed up well, so I want it to be the first thing to hit the blade. 2) Add your fruit! I usually buy a bag of bananas from Costco. I'll go home and peel them, then cut them in half. I stick them in a Ziploc baggy and put that in the freezer so they are all ready for my smoothie! I don't freeze the strawberries (but you could if you want!) and I just cut the stems off and cut them in half and throw them in the blender! 3) Stuff in your greens! Seriously guys, that was a rough estimate of how much I put in, but I load my greens up to the top. You can hardly taste them! I buy the huge bag of spinach from Costco and Kale from Sprouts. 4) Add your Greek Yogurt. You don't have to add this, but I think it sweetens it a little and makes it a little more creamy. 5) Add your juice and almond milk! I don't actually measure these but what I put above sounds about right. Play around with it to get your desired consistency. 5) I blend until everything is blended together really well. 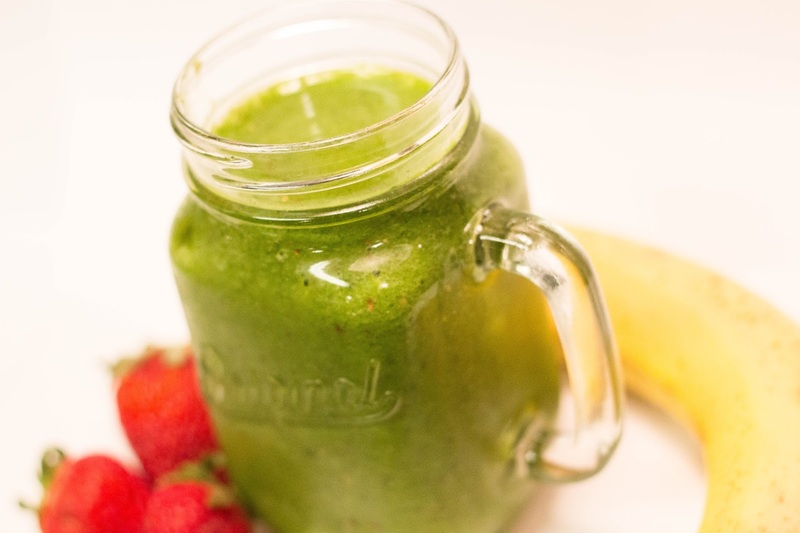 You did something wrong if your smoothie doesn't come out green haha. I hope you guys enjoy this simple recipe! I would love to hear how you make your green smoothies! Let me know your favorite recipe in the comments! YUM I haven't tried a smoothie with almond milk yet! Now I will!